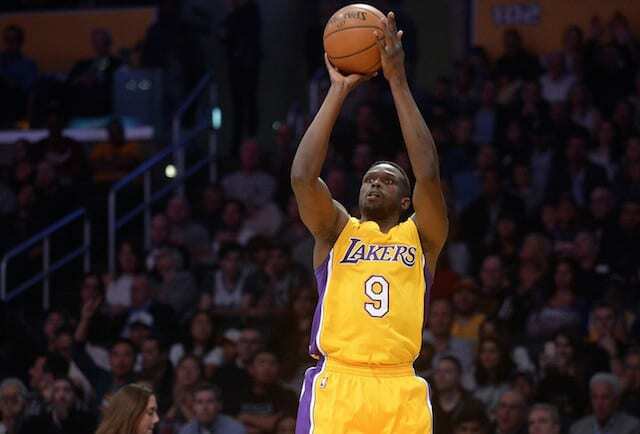 Lakers Rumors: Lottery Pick Necessary To Shed Luol Deng Contract? 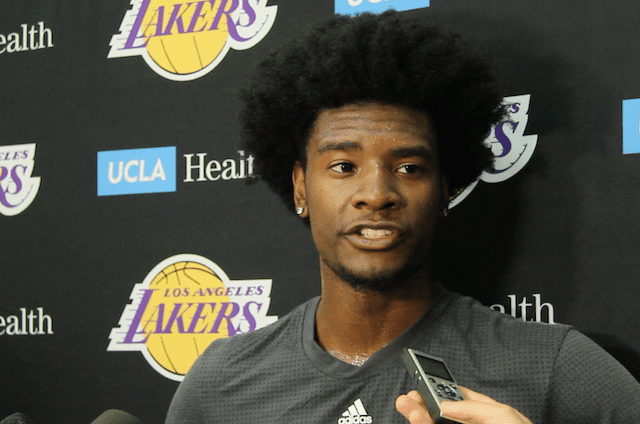 The Los Angeles Lakers brought in Kansas forward Josh Jackson to their Lakers practice facility on Tuesday afternoon, following an individual morning workout with De’Aaron Fox. His second workout with the Lakers (Jackson worked out for the Lakers in Sacramento last week), Jackson said this workout test his conditioning, as well as his weaknesses. Jackson also discusses how he sees his game translating to the NBA, complementing Brandon Ingram and how anger management courses have helped change his perspective. What was different from today’s workout (in comparison to your first workout with the Lakers)? Today I just felt like I was a little more in shape, but other than that I don’t think there was much of a difference. It was good to come out here and just show what I can do to the organization and feel happy with my performance. What do you think you could show to the organization? Just that I’ve been improving on a few of my weaknesses a lot of things people know I can do. I’m athletic, I’m long, lanky, just trying to show that I’ve improved since the end of the season at Kansas. What was the focus of the workout today? The focus was just to see if I was in shape, I think just shooting and like I said before trying to see if I’ve been improving on my weaknesses, ball handling a little bit, shooting and I think I did pretty good. What was your reaction when you heard they wanted to bring you in for a second workout? I was excited, all for it, course I’m not going to tell them no, but it was just an honor to be here again today, I just want to thank the whole organization for having me. Was this workout any different from the one up in Sacramento? The one up in Sacramento, I was kind of training with my trainer a little bit, so I was doing a few things that I was used to doing, so I was kind of in my comfort zone back then, but today I kind of got out of my comfort zone a little bit working out with their training staff and I think both went pretty good. Do you think they were impressed that you could make changes that quickly? I don’t know if they were impressed or not but hopefully they were. 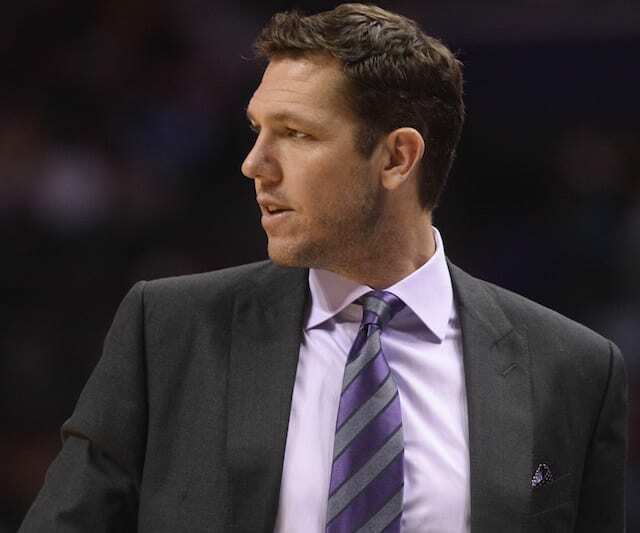 Versatility has become an increasingly important thing in the NBA, where would you say offensively and defensively are positions that you can guard and position that you would play best? The way the game is going today I think I can guard 1-4. But back then 10 years ago, your 4 man probably would have been 6’10” or something like that so probably not, but the way the game is changing so much today versatility is really important and I think I bring a lot to the table especially being able to switch on pretty much any position, except the 5. You played a lot of 4 at Kansas, what do you think on the offensive side, could you do some 2-3 or would it be more small 4, how would that develop? I think I can play pretty much 1-4 for an NBA team, playing the 4 at Kansas really helped me out a lot. I wasn’t too excited about playing the 4 coming in at Kansas but we caused a lot of mismatch problems and I think it really bettered me as a player. Since a lot of people don’t realize that you were actually playing out of position that entire season at Kansas, how do you think that might have helped you or could have hindered you as well? It just made me more versatile and prepared me to be bale to play multiple positions in todays NBA league and also guard multiple positions. Do you think you could play the 4 right off the bat as a rookie in the NBA or do you think that’s something you’re not ready for yet? I think I would have to develop into that a little more, get a little stronger, put on a little more weight, but it’s definitely something I can develop into. My strengths are quick, versatility, athletic, a great passer. Weaknesses, probably ball handling a little bit and probably still my shooting stroke but both of those are coming along. What’s it like working out in front of Magic Johnson? It’s an honor, just having such a legend here watching me and kind of mentoring me a little bit and giving me advice just glad to be here in front of him and hopefully I impressed him. What’s it like being one of the few non point guards at the top of the draft? It feels good, the point guards in this draft are really really really good, they are special. I don’t think you can really look past anybody in this draft, point guard or forward, doesn’t matter. I think this is a really good draft class and probably one of the better ones I’ve seen in the last couple years. What are some examples of doing things in your comfort zone in your workout in Sacramento versus today? When I was in Sac I was working out with my trainers, I was working out with him everyday. 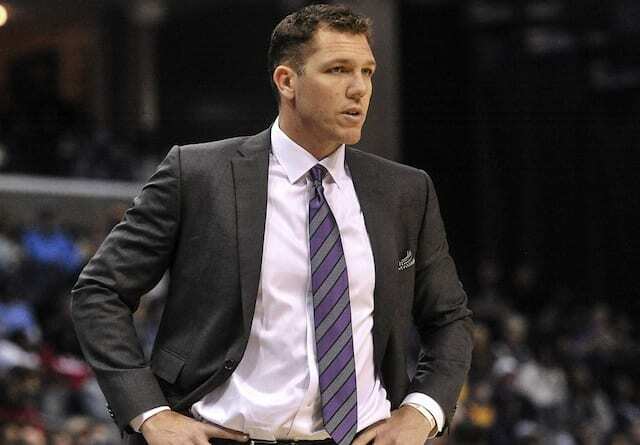 I’m comfortable with him, I know what he wants to do, we’ve got the same terminology, we’re familiar with each other, but coming out here I have to learn a little bit more about their terminology and things they like to do and they put me in a few instances where I would probably be in their offense and hopefully I impressed them. When they decided to bring you in for the second workout, was there any thought that maybe you’re their guy? Yeah, but it was definitely just more of a come in and try to impress them and hopefully I impressed them enough, but they can’t look past any guy in this draft, because we’re all really, really talented and I think we all bring a lot to the table. How do you think having another big wing like Brandon Ingram could complement each others games? The NBA is changing so much, you look at two of the best teams in the league, the Cavs and the Warriors and at the end of the game, when it’s winning time, there is no 5 man on the court, there is no 4 man on the court, there’s pretty much forwards and guards all playing at the same time, so I don’t really think me and Brandon being the same position would cause any problems, I think it would be really special honestly. Not to put you on the spot, but after the lottery there were some reports that came out about you taking anger management classes. Is there any truth to that? There is truth to that. I have been taking an anger management course, I’m just about wrapping it up right now. It’s just something that I had to do, and I learned from the mistake that I made and I’m making it through it. What did you get from that (the anger management courses) overall? One of the biggest things I got out of it was just to control the things that I can control and not to worry about the things that I can’t and it sounds so simple but I went home and thought about that a lot and I went home and it made a huge amount of sense to me, because there are a lot of things in this world that we can’t control but yet frustrates us but we just can’t worry about them too much. I would imagine that one of those things you can control is how you do perform on the basketball court. I know some of your high school coaches have said that there is a switch in you that changes, when you get on the court. What are they referencing? Just my will to win, growing up I’ve always hated losing and loved winning. I’m just one of the guys that will do whatever I have to do to help my team win, whether that’s play defense, dive on the floor for a loose rebound, or score, whatever I have to do to win, I’m going to do it.